A NEWBRIDGE student was honoured for his exceptional promotion of mental health by being selected to take part in a national leadership programme. 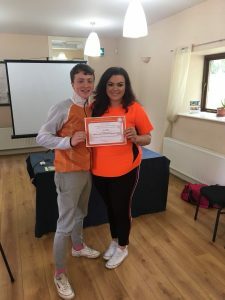 Patrician Secondary School student Sean Molloy was selected to be a student leader ambassador at the annual Cycle Against Suicide retreat which took place recently. The retreat, now in its fifth year, recognises students for their exceptional contribution to the area of mental health. The aim of the student leader ambassador programme is to empower young people to bring the Cycle Against Suicide message – ‘It’s okay not to feel okay; and it’s absolutely okay to ask for help’ – back to their schools and communities. The student leaders actively participate in all Cycle Against Suicide activities throughout the year. The fifth-year student was nominated by the school and selected from hundreds of applicants. Seán and his fellow student leaders gathered in Wicklow to participate in a wide range of workshops including media skills, outdoor pursuits, team building, presentation skills and leadership training. As well as participating in workshops and presentations, students also collaborated to develop a theme for this year’s congress, which will take place in Dublin in January 2019. “It is a huge honour for Patrician Secondary School to have a student selected for such a prestigious and worthwhile programme at a national level. We are immensely proud of Seán’s achievement,” said a spokesperson for the school.